The government will arrange the biggest-ever nationwide programme to celebrate the birth centenary of the Father of the Nation Bangabandhu Sheikh Mujibur Rahman. Prime Minister Sheikh Hasina on Wednesday revealed the plan, saying Bangabandhu’s birth centenary will be celebrated even at the grass roots level from March 17, 2020 to March 26, 2021 so that all people can know the real history of Bangabandhu and the Liberation War. She was addressing a joint meeting of the National Committee for Celebration of the Birth Centenary of Father of the Nation Bangabandhu Sheikh Mujibur Rahman and the National Implementation Committee for Celebration of the Birth Centenary of Father of the Nation Bangabandhu Sheikh Mujibur Rahman. The country will also celebrate its golden jubilee on March 26 in 2021 and that’s why the government will observe Mujib Year from March 17 in 2020 to March 26 in 2021. 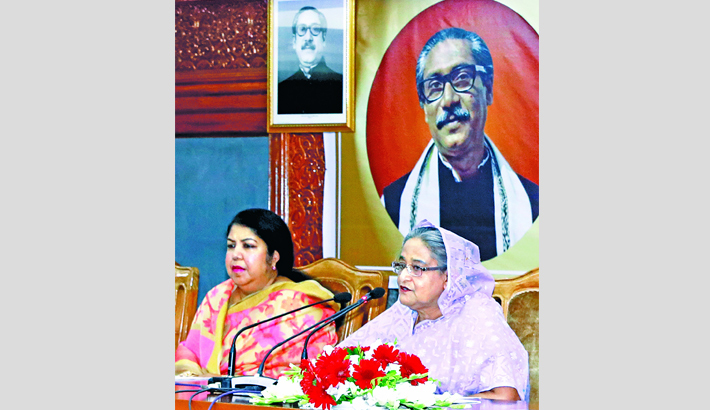 “We’ll take measures for the celebration of Bangabandhu’s birth centenary at the grass roots level so that people can know the correct history and get imbued with the spirit of Liberation War,” she told the maiden meeting of the two committees at the Prime Minister’s Office. Sheikh Hasina, who is the head the National Committee for Celebration of Bangabandhu’s Birth Centenary, received proposals from members of the two committees to chalk out programmes for the grand occasion. The premier said it is a national duty to celebrate the birth centenary of the Father of the Nation in a befitting manner for his huge dedication for the wellbeing of the people. “He (Bangabandhu) passed valuable time of his life in jail,” she said. Sheikh Hasina, the eldest daughter of Bangabandhu, said Bangabandhu took a nation to an armed war from the non-cooperation movement by gradually motivating people. Terming it a rare example in the world history, she said Bangabandhu gave political independence to the people of the country and also took measures for their economic emancipation during his three and half year tenure. “He did huge work in every sector in a short time,” the premier added. Referring to the 15 August carnage, she said Bangladesh would have turned into a developed country years ago if the dark night had not come in the life of Bengali nation. The premier said there were efforts to completely erase the contributions of Bangabandhu to the Language Movement alongside his contributions to the Liberation War. “But none can suppress the truth as it must come into the light. Now we are getting the proof of it,” she added. Earlier on February 14, the government formed a 102-member National Committee for the Nationwide Celebration of the Birth Centenary of Bangabandhu. Sheikh Hasina has been made the president of the committee while prime minister’s former principal secretary Dr Kamal Abdul Naser Chowdhury its member secretary. The government also constituted a 61-member Birth Centenary Celebration National Implementation Committee. Speaker Dr Shirin Sharmin Chaudhury, Chief Justice Syed Mahmud Hossain, Chairman of the Law Commission Justice ABM Khairul Haque, former finance minister Abul Maal Abdul Muhith, National Professor Anisuzzaman, National Professor Mohammad Rafiqul Islam were present. Speaker Shirin Sharmin Chaudhury, Awami League senior leaders, including Amir Hossain Amu, AMA Muhith, Tofail Ahmed, Matia Chowdhury, Sheikh Fazlul Karim Selim, Workers Party of Bangladesh president Rashed Khan Menon and Jatiya Samajtantrik Dal faction president Hasanul Hug Inu, among others, also spoke at the meeting.